When it comes to modern engineering feats, the American couch potato has largely been left by the wayside. 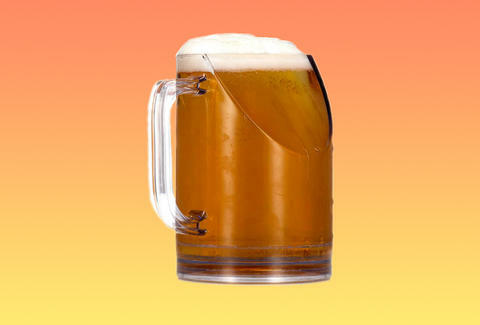 Innovation is for the go-getters, the dreamers and titans of industry, but now, even beer mugs are getting their comeuppance. Behold, the TV Beer Mug, which offers a clear line of sight to the television while you sip some cool, frosty suds. Most mugs hinder your ability to watch the game as you funnel beer into your gullet. The TV Beer Mug, on the other hand, has one side cleanly removed, so you can lock in that tunnel vision while enjoying a cold one. Honestly, though, beer mugs must be in for a massive design overhaul after this $11 mug becomes the standard bearer of Super Bowl parties and sports bars. The marriage between TV and beer has never felt more alive, and your couch has probably never felt more accommodating. You have hifalutin beer mug mechanics to thank. Sam Blum is a Staff News Writer at Thrillist, and a large proponent of hifalutin beer mug mechanics. Follow him on Twitter @Blumnessmonster.